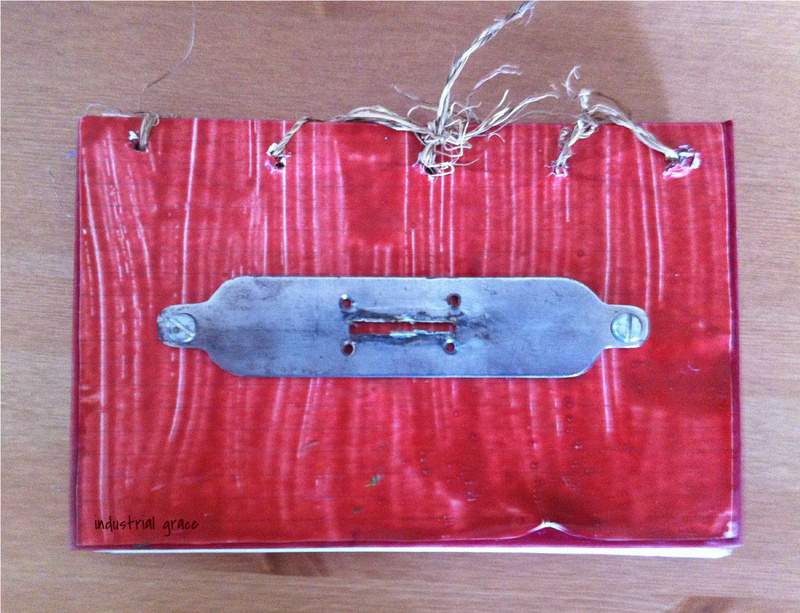 About three years ago I look a “Book Arts” course, which included some bookbinding techniques. That class prompted me to try my hand at that sort of thing, though I’m driven to use a slightly different assortment of materials than we did in that class. This book is much more recent, made when I was at my parents’ new house in California. My goal was to use the items I had on hand, which meant a lot of miscellaneous bits of paper from my childhood. The lined and graph paper for the text block were the remaining unused pages from the school notebooks of my childhood, while the unlined pages were from an old address book. I used the outer part of the address book as bookboard, and covered it with a piece of lined paper painted with some of my father’s homemade milk paint. I finished off the front using a piece of metal that I found locally in my parents’ neighborhood, and bound the whole thing with a piece of fiber rope, which I believe was made from New Zealand flax, known as harakeke to the Maori.